Could This Be The Blackberry That Saves RIM? Five years ago Research In Motion, the company that brings you Blackberry, had a stranglehold on the burgeoning smartphone market. With the introduction of the 8300 series of Blackberries it seemed almost a forgone conclusion that if you wanted email and web access on your hip or in your pocket you turned to Blackberry to offer you a solution. The only competitor that was on the landscape was Palm, who was primarily known for making Personal Data Assistants (PDAs). But oh how times have changed. Since then Apple introduced the original iPhone which changed the way the world uses smartphones, and has grown to be one of the world’s largest mobile phone manufactures. Other competitors have also entered the fray including a bevy of manufacturers that run Symbian, Android and Windows Phone. While Symbian and Palm (now owned by computer hardware giant HP) seem destined for the obscurity, Apple’s iOS platform, Android and Windows Phone have steadily and systematically begun to eat RIM’s lunch. That all could be changing with this beauty. 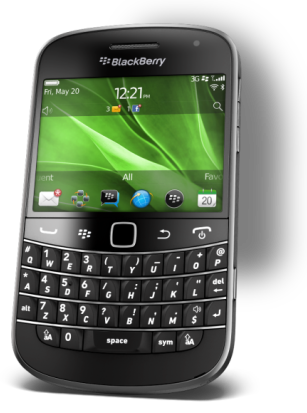 The Bold 9900 series adds the stylings of the original Bold 9000, the functionality of the Bold 9700, the reliability of the 8310 and the promise of the Torch 9800. It runs Blackberry’s OS7 and does it well. Unlike it’s brother the Torch it has the processing power and RAM to run a modern smartphone OS, making it less glitchy and more responsive. Gone are the days of pulling the battery out of your phone because it freezes constantly. In the two weeks that I have been using the phone as my primary work device I haven’t had to pull my battery out once; a statement that I could not make while using the Torch. The size is more appropriate for a physical, portrait keyboard than some of their previous offerings. It feels right in my hands, and has the famous Blackberry texture to it that makes for easy lightening fast typing. The touchscreen, while smaller than other smartphones, works well with the phone. Gone, thank God, is the unusable software keyboard, which is unnecessary on this model. Some links are hard to select, because the screen is so small, but the pinch to zoom function alleviates most of these issues. The camera is a respectable 5MP model. While I would have liked to see an 8MP or better, the camera is certainly sufficient in most cases. If the phone has a downfall it is in the Blackberry App World. While there are most of the big name applications (Facebook, Twitter, Pandora and NFL.com), the selection is limited. There are several "apps" that are missing including business mainstay LinkedIn (not compatible with OS7), social networking up and comer Google+ and games like Zynga's popular Words With Friends. If RIM wants Blackberry to succeed it will have to take some extraordinary steps, similar those taken by Microsoft and it’s Windows Phone platform, in order to woo developers into their camp. After all, the apps are one of the primary reasons to purchase a smartphone. Apps turn your phone into an all-in-one device (gaming, social networking, music, organization, communication etc.) as opposed to a single use device. So, will this device save RIM? In a word: Doubtful. There is a lot of work to be done at our brothers to the North. But it is a step in the right direction. RIM needs to focus more on the future, while keeping an eye on the past. Recent news that they were going to begin offering access to their servers to iOS and Android users is a step in the right direction. These newer, more modern platforms could create a whole new business for RIM. Continuing to develop products like Blackberry Messenger, and offering it to more than just Blackberry users would also be a great idea. But that is a decision that will have to be made in Waterloo, Ontario.